Ever have one of those life changing turning points? Well Maggie was ours. Back in 1999 we took a trip back to the Midwest to visit family. We had semi-retired….and were full timers in our only home…an RV…and had our travelling companion, Kaile. My sister wanted to visit a neighboring farm that had puppies to see about adding another to their family. Who could resist playing with puppies? Not me! 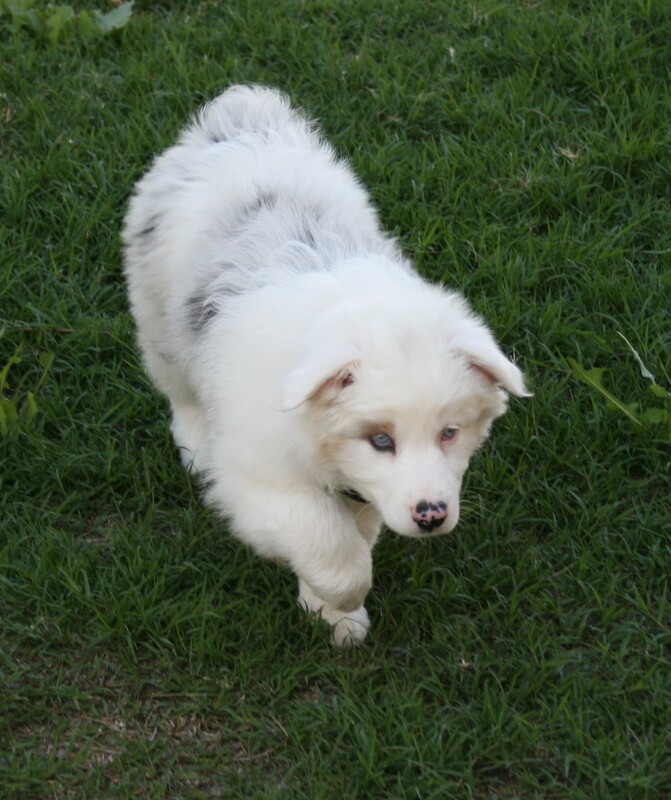 And these were cute little Aussie mixes. While playing with the little ones, I noticed a white puppy all by herself and went over to investigate. I picked her up and immediately noticed her eyes were not normal. No wonder she was not with the otherpups…she was blind! She was happy to oblige me with an overabundance of kisses and puppy breath! Immediately I felt a connection with her…and knew that for some reason….she was to be with me. I had no idea why I felt this way, but it was an urgent need to be with her. So Jim and I talked to the owners, agreed that a blind puppy would not do well on a farm (goes to show what we knew then!!) and we traveled back to Salt Lake City, UT with a new 5 wk old puppy named Maggie. And boy….did she steal our hearts! It wasn’t until a couple weeks later that we discovered she was deaf as well. The vet advised us to “put her down”….she would have no life and would not be able to function with any quality of life. Lots of tears and the ultimate answer was NO. She just seemed too full of life and happiness. So started the research on deaf/blind dogs and the discovery of “Lethal Whites”. Who knew there were others like her out there? We knew her mother to be part merle Aussie and her father to be a pure merle Aussie. We contacted her previous owners who had no idea why this had happened. They had their dogs spayed/neutered as another pup in the same litter had been born deaf. He had found already found a happy home. Maggie was so easy to work with. She learned easily sit, stay, down, come, shake, etc. She never chewed up things she shouldn’t, and was quickly housebroken. Since we lived in the motorhome, she also learned not to exit without having her leash attached. 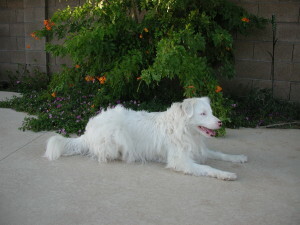 We surfed the internet to learn all about “lethal whites” and after moving to AZ, discovered a rescue (Aussielads) that had lethal white pups in foster care. We decided to buy a home and shortly after, started in their foster program. One thing led to another….and we decided a rescue needed to exist for Lethal Whites. Amazing Aussies was “born”. We still have our “retirement” motorhome…we use it now as a quarantine and an infirmary when needed. We both work full time. Who has time to retire with all the Education that still needs to be done? Maggie has been our inspiration and had we not found each other that day years ago….who knows where we would be now or what would have happened to all those lethals we have brought into the rescue and with the help of our foster homes and volunteers….were adopted into their own forever homes. And of course there is the education that has been shared….how many more were saved by “prevention” or by other rescues? Yes…Maggie was meant to come to us that day and through us became a guardian angel of sorts for hundreds of others. She has traveled from Calilfornia to the Carolinas, from Michigan to Texas and all points in between. She’s been hiking and camping, played in the snow and swam in the oceans. Not bad for a dog that the one vet told us would never have quality of life!